Ungroup the map, and each area is an individual element that you can color. Testimonials Click here for the full list. "Thank you! Your product is wonderful. It has really saved the day for us." "Thank you very much... I appreciate your personal service. This map helps me out in a big way with a presentation. So glad I found your services on the internet." "Thank you very much for your message and the Mercator map! Impressive stuff! My compliments." "Thank God I found your website. I was almost in tears the night that I found your website. You see, I am still new at the place I work for. I work for a department that uses maps to show where we have sales people located throughout the United States including Alaska. We also use maps to show where our top consumer electronic customers are located. Thank you Bruce Jones Design." A Complete Clip-Art Map collection for one low price with World Maps, USA Maps, State Maps, USA County and Globe Maps PowerPoint, EPS, GIF, and JPG, Outline, editable clip art maps. Royalty free, easy to customize and edit. Ready to use for your business and marketing presentations. Download to your computer outline clip art maps for desktop publishing, PowerPoint, presentation, illustration and web development. Black and white and color maps are downloaded directly to your computer from this site, one time price for a one year subscription, return anytime for more. Maps are ordered and downloaded directly from this site. If you are uncomfortable using your credit card over the internet, feel free to call us at (781) 255-7171. We will be happy to process your order over the phone. These unique professionally hand-drawn outline black/white and color maps are ready to use or can be customize to fit your specific needs. Our royalty free maps are available in both Macintosh and PC/Windows formats for both print and electronic/web uses. Clip-Art Maps are perfect for illustrations, PowerPoint business presentations, Web pages, brochures, newspapers, magazines, reports, newsletters, and classroom use. 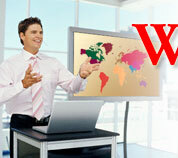 Maps work with popular page layout, presentation, illustration, and writing programs. Clip-Art Maps are easy to modify and use with popular page layout, presentation, graphic/illustration, and word processing/writing programs. All electronic products are royalty free for both print and electronic uses. Each clip-art map is a closed, separate element with like items such as text or countries, grouped together to make customizing easy in an illustration program. We recommend you store your collection on your hard disk. A graphics program (such as Adobe Illustrator, Macromedia Freehand or CorelDraw) is needed to customize our EPS maps. PhotoShop or similar is needed to customize the JPG and GIF maps and MS PowerPoint for the PowerPoint maps. Software developers for publishers who want to include numerous maps in their clip-art collections or software projects can obtain full map collections by purchasing an inexpensive royalty free license. please send us an e-mail or call (781) 255-7171. We will be glad to help if we can.